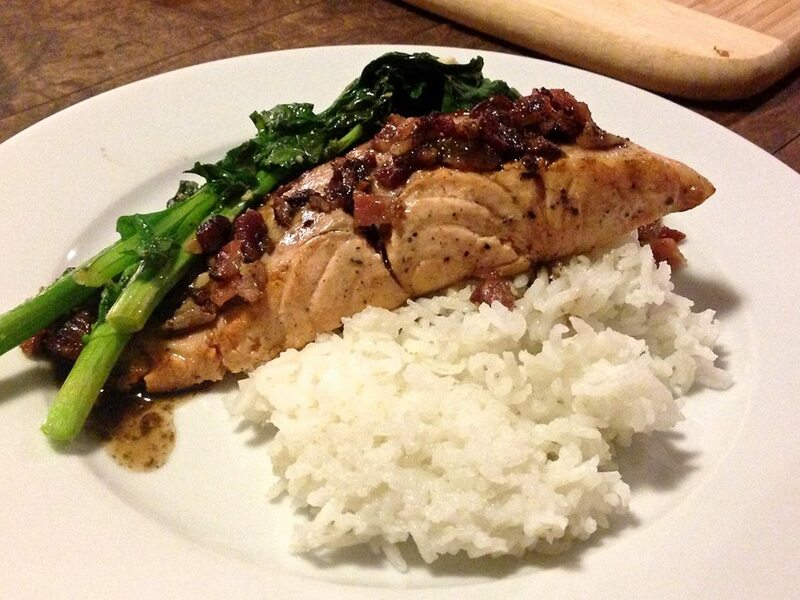 Salmon filet marinated in orange juice and sautéed in bacon fat, lying decadently on a bed of basmati rice accompanied by sautéed rapini tossed with roasted garlic, olive oil and lemon. And is if that did not sound delicious enough, the salmon is drizzled with squares of bacon from whence the aforementioned fat did come, and a reduction sauce made from the orange marinade all cooked in the bacon and salmon juices. Oh yes! Variations: try this with salmon steaks, or any other meaty fish. Sauté the bacon and then dice and set aside. Place salmon skin side up in still-hot-with-bacon-fat pan and sauté for 2-3 minutes until halfway done. Then flip over, turn off heat and cover for 2-3 minutes. Remove salmon from pan, turn heat back on to medium and pour in the leftover marinade, deglazing the pan and reducing the liquid until you have a nice pourable consistency. Then, plate your salmon, add bacon cubes as garnish and drizzle over all of it with the sauce. Et voilà!